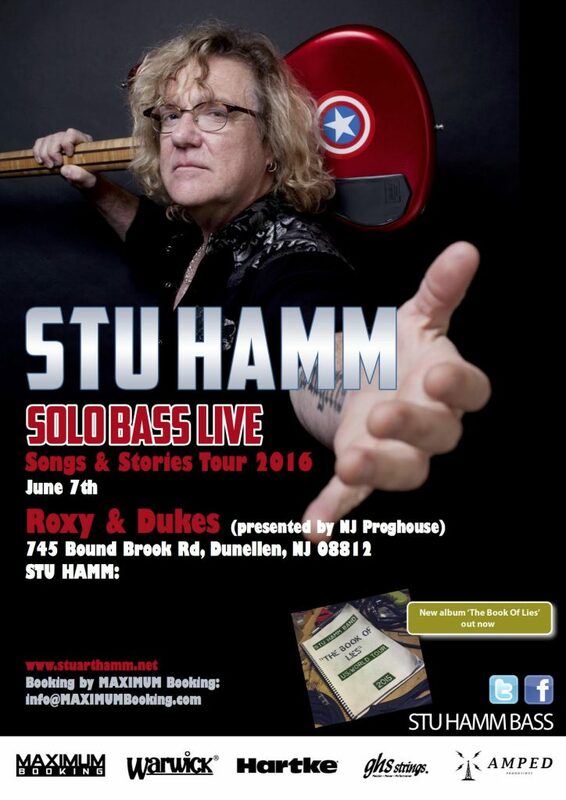 Having stunned audiences across the world with his innovative playing, Stu Hamm — the only bassist to win Guitar Player magazine’s readers award for both best rock bassist AND best jazz bassist in the same year! — has made a name as the go to bass player for the world’s great musicians. His time spent playing with Steve Vai and Joe Satriani cemented his place among the greats and gave Stu the platform to display his pioneering bass techniques to adoring crowds worldwide. Hamm has performed and recorded with Steve Vai, Joe Satriani, Eric Johnson, Michael Shenker, Frank Gambale, and many other well-respected guitarists. It was playing live on tour with Satriani that brought Hamm’s skills to national attention. Subsequent recordings with Satriani and other rock/fusion artists, along with the release of his own solo recordings (featuring a.o. keyboard player Tommy Mars, guitarists Alan Holdsworth and Robert Fripp, drummers Steve Smith and Tommy Lee), solidified his reputation as a bassist and performer. Hamm has travelled the world from Berklee to Belfast to Budapest to Bali to Berlin. He’s performed in a 19th century circus tent with Joan Baez, and recorded a duet of “Do Right Woman” with her. Hes performed with Mick Jagger, played sold out shows at Royal Albert Hall and in front of 120,000 people in Mexico City with a Mexican Rock Band…he’s also played cruise ships, weddings and put on a tux and played Christmas Songs at department stores and in between the airport transfers, hotel suite check-outs, backstage room dinners, and concert hall performances, has collected countless stories and anecdotes from his travels across the globe. Now promoting the release of his newest solo album ‘The Book Of Lies,’ Hamm takes to the road with new music, including his petite suite for solo bass, and a host of stories and anecdotes for musicians and non-musicians alike. A gut rumbling mix of new and old hits mixed with Stu’s trademark humour and story-telling make for a unique show like no other.